I finished the book and really enjoyed it. Scott's review below is right on. I would add that "Tracon"
is not only "technically correct" , it is also an excellent story, well written and interesting. TRACON is 100% Technically Correct ! 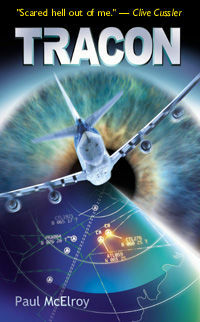 Paul McElroy's TRACON is the first accurate representation of what the Air Traffic Control environment is really like. As an 18 year ATC veteran, I was immediately drawn into his novel as he precisely described incidents in which TCAS (Traffic Alert/Collision Avoidance System) caused aircraft to climb/descend and put themselves in closer proximity to other aircraft--all in direct confliction with the controller's instructions! Kudos to Mr. McElroy for shining some light on a problem that continues to plague the aviation world to this day. TCAS is a valuable awareness tool for pilots, but allowing a computer to override the judgment and pre-planned actions of an air traffic controller is a subject for serious debate. I found this book to be addictive; I didn't want to put it down. After watching the disappointing air traffic movie, "Pushing Tin", it was a pleasure to read an authentic accounting of what goes on at the radar scope. McElroy manages to capture everything perfectly! I rate this book at 5 stars.